The hair clipper Wahl 8470-500 Professional Super Taper II Hair Clipper Set is a powerful, adjustable and attractive hair clipper. A must have product for barber shops and hair salons. It is a strong product with powerful V5000 motor made in the USA and comes with eight different attachments with a color code that include a set of combs, oil, cleaning brush and an instruction manual. This can be used efficiently at a salon, barber shop, or at home. You can get a professional hair look even at home with this unique and powerful hair clipper set by Wahl. It is suitable for any hair. Wahl 8470-500 Professional Super Taper II Hair Clipper Set is a haircutter which can be conveniently used at hair salons, barber shops or as a household. This is professional haircutter with strong and powerful performance with a V5000 strong motor which is capable of cutting any hair from thick to wet. It contains a strong grip which will easily fit in your hand making it comfortable to cut the hairs carefully. 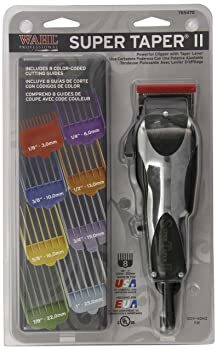 This hair clipper set comes with eight attachments that are eight different combs with color codes to make it easy to use and manage the length. All the combs are of a different size for different length cutting. The color codes have a touch mechanism which makes it easy to change the code without much hustle of reading the instruction every time you want to change the size. Wahl 8470-500 Professional Super Taper II Hair Clipper Set contains eight different combs, a cleaner brush, oil and an instruction manual. The combs contain color codes which make it easy for maintaining the length of the hairs, the codes can be operated by just one touch. The sizes of the attachments are 1/4″; 1/8″; 3/8″; 1/2″; 5/8″; 3/4″; 7/8″; and 1″. This is a very easy and quick hair cutter for all hair types. The accessories are easy to use and simple to manage; you can read the instructions on how to use these accessories accurately. 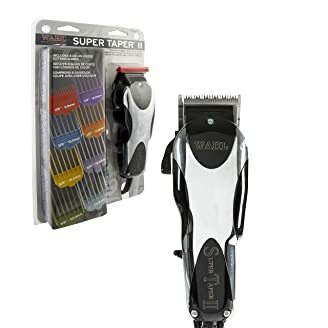 Wahl Super Taper is a high performer and powerful hair cutter with strong blades, which can cut any hair whether thick, short, and long or wet. The device is not cordless, but the cord is long enough so that you can easily move around and it will not come in your way. It gives a professional hair cutting easily as and when you want. The blades are designed in such a way to give you a safe and good performance and can be used every day if you want. The clipper contains two blades, which work together to manage the hair cutting. On blade is stable and the other on vibrates to cut the hairs. So these blades are always in working positions that’s why they need regular oiling and cleaning to keep the edges sharp and smooth. This will prevent them from becoming blunt or get jammed and reduce the hair cut quality. It is also safe to clean the blades regularly as it may contain impurities from the hair. 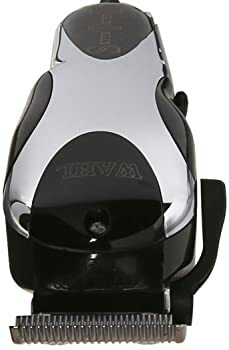 You can buy Wahl 8470-500 Professional Super Taper II Hair Clipper from amazon.com at a convincible price of $$ along with free shipping. The product is shipped with the United States. You can also buy it from a number of other online retailers. It is easily available at online stores. You can use Wahl 8470-500 Professional Super Taper II Hair Clipper as a trimmer to trim your beard as it is easy to use and is powerful and can be used daily. Powerful and durable: The best part of this clipper is that it is robust and strong with V5000 powerful motor to give you perfect and professional cutting even at home without going to a salon or barber shop. This is strong and durable as it has high-quality blades and attachment that can be maintained easily by simply cleaning them regularly. Wahl 8470-500 Professional Super Taper Hair Clipper is durable and will last for long years. Easy attachments with size codes: The product comes with eight attachment codes that are color coded which enables you to make easy changes in size ranging from 1/8 to 1inch. These codes are touchable so can be operated easily by finger touch. You can easily change the code depending on the lengths without even reading the instructions again and again. Regular use: The biggest advantage of this product is that it is safe to use daily. The high-grade blades are easily adjustable and sharp and smooth, which makes it convenient to cut even strong thick hair. You can also use it to trim your beards. As it comes with smooth blades, they can easily trim your beards with no harm. The sharp edges of the blades are specially designed to give you a perfect cut with no harm. Soundless: Another advantage is that the clipper has very less sound and less vibration as compared to other hair cutting devices. This makes your cutting silent and in peace. This quality of the product makes it a robust and high-grade product as compared to other hair cutters in the market. Heavy: The product is bulking and heavy which makes it difficult to hold for a long time duration, and this may be the reason behind less sound and vibration. Contains cords: These cords make the product difficult to be easily carried. Although the cords are long enough, many find cordless devices more convenient. All in all Wahl 8470-500 Professional Super Taper II Hair Clipper Set is a robust and professional-grade product to give you a perfect haircut same as a salon or barber. A well designed, sound proof, low vibration and strong blades make this product a must-have for you. Hair cutting is a serious work which requires a strong and professional touch because if went wrong then can affect your entire look. This product promises to give you the desired hair cutting easily and in very less time with its amazing comb attachments. The best thing about these combs is that they will suit your hair type and will take care of the hair length with only one touch. The instruction manual included in the set will guide you to use this product and take care of the attachments easily and carefully.